Premier-elect Daniel Andrews was reported to have met with Prime Minister Tony Abbott to speak about infrastructure projects, specifically about their stalemate on the controversial $7 billion East West Link project. The Australian reports that Mr Abbott requested Labor build the East West Link, while Mr Andrews denied this request. The ­relationship between Victoria and Canberra has been tense since Mr Andrews was elected, as Mr Andrews promised to tear up the contracts for the cross-city road and prepared to release the project’s paperwork. Mr Andrews comments on the road link strongly suggest that he is looking for a mediated solution with the East West Link builders as well as to play down the split with Mr Abbott. "He invited me to break my commitment to the Victorian people around East West Link and I indicated in a respectful way that I would not be doing that," Mr Andrews told radio station 3AW. "He wants to be an infrastructure Prime Minister, I want to be a Premier that is about outcomes and who is about delivering on all the commitments I have made. I think there is some common ground there," Mr Andrews said. The Age reported Mr Abbott threatened to withdraw the $3 billion of federal funding promised for the East West Link from the Victorian budget. Despite this Mr Abbott consistently said Commonwealth funding can only be spent on the East West Link, the Abbott government is considering redirecting the funds to NSW road projects, including Sydney motorway WestConnex. However, Abbott made a statement during a media conference on Monday morning that the funds were available for the East West Link. "We relentlessly backed the East West Link and I continue to believe this is a vital piece of infrastructure for Melbourne, Victoria and Australia," Mr Abbott said. Mr Andrews told 3AW it would be "unwise for a federal government to cut infrastructure funding,” adding that the West Gate distributor project would be on the market by January 2015. As a result, Mr Andrews spent Sunday meeting with senior bureaucrats to discuss releasing the East West Link business case and contract to the winning consortium. "They build things, I’ve got plenty of things to build,’’ Mr Andrews told Fairfax Radio. 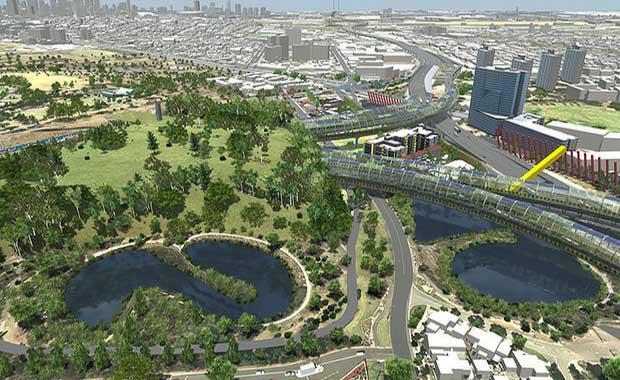 Discussions have reportedly introduced an alternative crossing of the Maribyrnong, potentially alleviating the need for compensation of the road project. According to The Australian, Mr Andrews has vowed to scrap the first half of the project despite the contracts having been signed and houses being bought by the state to make way for the cross city project.